The milled species Panicum miliaceum carries different popular names because it appears in different colours. Proso millet is the official name, but the silvery or whitish variety of this milles species is also-called French white millet. 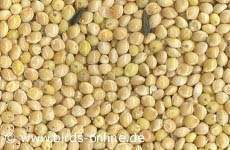 It is easy do digest for pet birds and therefore can be found in many common seed mixtures. You can also use this sort of millet for preparing spouted seeds. It's great fun for budgies and other small pet birds if you serve French white millet sprays. Even though birds love to eat this treat, Panicum miliaceum in the spray is not available all around the world. But it's worth trying to find a shop that sells this bird food.